Home Siding is a critical component in the home design and planning process of your home. There are so many types of home siding and home siding colors it can become difficult for a homeowner to determine what home siding is right for their home. The home siding article below discusses vinyl siding, cedar siding, masonite siding, and pine siding. There are a number of siding choices a do it yourself homeowner can consider. My experience has mostly been with clapboard style siding, so my examples and opinions are somewhat limited. But I’ll review the types I am familiar with. Pine Home Siding: I used this once on one of my homes and swear that I will never use it again. Within 2 years the clapboards were cupping (curling) and the nails were popping out. By the third year the home owner needed to re-side the house. It is relatively in-expensive in the short term, however you will pay for your decision again within 2-3 years. Vinyl Home Siding: Definitely the most popular today. It comes in many colors, textures and gauges (thickness of the Vinyl). It is very easy to maintain and is very cost effective. A power spray wash once a year and it looks like new. My only issue with it, is that it still “shines” and is not as durable in high wind locations. If you can live with these issues, then Vinyl siding is a good choice. Masonite Home Siding: This has the texture of Cedar or Pine Siding, however a lower cost point than Cedar. If installed correctly I have seen this material wear very well over a 15-20 year period. They key is: Installed correctly. If not installed properly, moisture can seep in, swell the material and eventually lead to rot. Cedar Home Siding: My preferred choice. Cedar holds up well to the environment and provides a level of richness and texture that is still not reproduced with Vinyl siding. It is however, quite a bit more expensive (approximately 2X), and will require painting every 5 years or so. 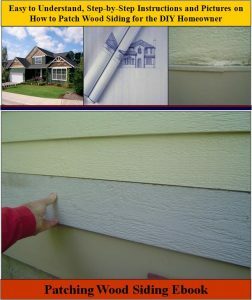 Patching Wood Siding Ebook – If you require detailed instructions and pictures for patching wood siding see HomeAdditionPlus.com’s Patching Wood Siding Ebook. This Ebook provides very detailed instructions, along with pictures for each key step in the process of patching wood siding. Get Free Siding Price Quotes with No Obligation! Fill out our 3-5 minute quick and easy form, and receive a free price quote on home siding from one of our prescreened and licensed siding contractors. This process is free and there is no obligation to continue once you receive your home siding estimate.